Children with special needs ought to have a special place where they are not reminded constantly of their problems. 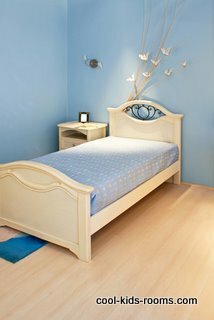 Decorating bedrooms for special needs kids isn't quite as easy as for other children. Allow your child to make choices regarding color and themes, though function needs to be considered before all else. If your child has physical disabilities, you need to have a bed that he can sit on and reach the floor with his feet. He may need railings. Doorways and walkways need to be larger than usual if wheelchairs or walkers are being used. Shelving, racks, hooks, and closet rods need to be lowered. Light switches need to be within reach. Door knobs must be manageable. Sensor lighting is a good idea. Make sure that you lay out the room in such a way that he can see out the window, watch TV, and enjoy the decorations in his room from his bed, if he is bedridden. Flooring should be easy to walk on or use a wheelchair on. Throw rugs are taboo. 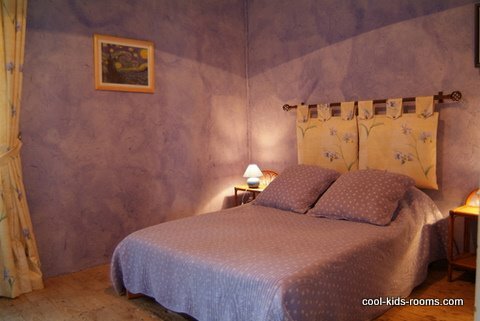 His room needs to be something he enjoys spending a lot of time in, and can easily navigate. If asthma and allergies are what you are dealing with there are other things to consider. Keep carpeting and fabric window treatments out of the room. They are dust catchers. So are stuffed animals, so a few small ones that you can pop into the washer are enough. You will need a dehumidifier to keep molds and fungus from growing. Mattresses, box springs, and pillows should be covered in vinyl zipped bags, to keep the dust mites out. Keep pets out of the room and use an air purifier. If you have kids with autism you need to be very careful regarding safety, over stimulation, and lighting. Do not use fluorescent lights, which have been known to cause seizures in autistic children. Decorating must remain simple and not confusing. It is usually best to use calming colors. Furniture should be heavy and sturdy. It is best to anchor it to the floor or to the walls. Cabinet and drawer knobs must be too small for using to climb, and must be too large for the child to swallow. Window treatments should not be reachable. If your child is visually impaired, safety must be the main factor in decorating his or hers room. Clutter, throw rugs, and moving furniture around are dangerous for the non-seeing child. The area around his bed must be kept clear, so that he can get up, use the bathroom or get a drink without stumbling. The route to the bathroom should be as straight as possible and kept clear at all times. Forearmed with knowledge, and careful planning, decorating bedrooms for your children will be a breeze!